Blepharoplasty is the medical name for eyelid surgery. The eyelid is often the first facial areas to exhibit signs of aging, so eyelid surgery corrects sagging or dropping eyelids. Full upper eyelids, known as dermatochalasis or blepharochalasis, can make you look tired and older than you are. 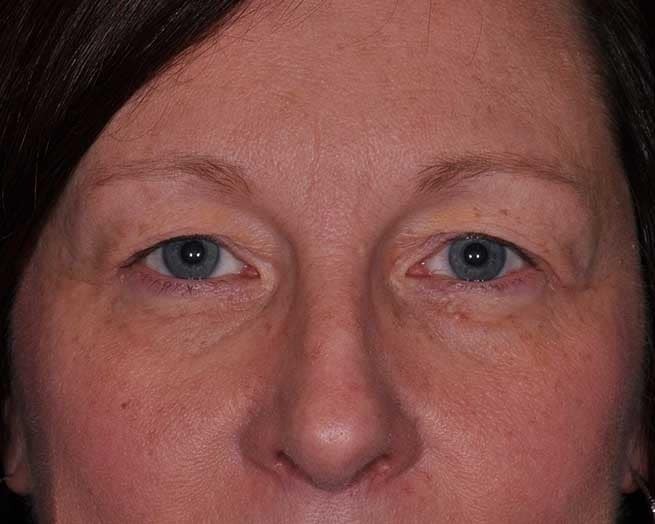 Eyelid surgery almost immediately restores a youthful appearance that will accentuate your eyes by removing excess fat and skin from the eyelid area. The results are usually very natural-looking and will result in a more relaxed and rested appearance. There are several different types of blepharoplasty, depending on what needs to be corrected. Whether your goals are more functional or cosmetic based. Candidates for cosmetic eyelid surgery are unhappy with the appearance of their upper eyelids and the impact it has on their overall appearance. If your upper eyelids are drooping, puffy, or have excess skin, you might be a good candidate for eyelid surgery. Ideal candidates must be in good health, have healthy facial tissue, and do not have any eye conditions. However, if your upper eyelids are causing problems due to visual obstruction, you may be a candidate for functional upper blepharoplasty, which is covered by health insurance. During your consultation, Dr. Holds, a Board-Certified Ophthalmologist, will discuss surgical goals, what is attainable, and will create a plan specifically for you. It is important to have realistic expectations and a mutual understanding of goals. Patients will need to provide a medical history, list of current medications, and disclose any major illnesses. Some medications may be off limits for a week prior to eyelid surgery. Next, Dr. Holds will perform an examination to look for any eye conditions such as dry eye. Certain eye conditions can limit or alter the surgical plan. Dr. Holds is highly knowledgeable of eye diseases and concerns. Some of the best facial and cosmetic surgeons in the St. Louis area refer patients to Dr. Holds. Eyelid surgery is one of the most popular surgeries that cosmetic surgeons perform. It is an outpatient procedure Dr. Holds performs under local anesthesia. In addition, patients can take a sedative that will help them relax or sleep during the surgery. The whole procedure takes about 1 to 2 hours depending on the patient’s eyelids. First, Dr. Holds will make an incision in the crease of your upper eyelid so that the small scar is hidden. Depending on what is causing the drooping lids, he will remove fat pockets or excess skin to create a normal, symmetrical lid. Of course, Dr. Holds and his associates are careful to optimize symmetry to make sure that your eyes match as closely as possible. Eyebrow position is also considered as it is particularly important in relation to upper eyelid surgery. Finally, Dr. Holds will close the incisions with sutures and cover the area with gauze. After surgery, you will need to have someone available to drive you home. After the anesthetic wears off, bruising, swelling, and soreness may develop. If necessary, medication can be taken to decrease the pain. Additionally, Dr. Holds may give you eye drops or ointments to apply for one to two weeks. Patients can visit Dr. Holds about 6-8 days later to remove the sutures. Patients will need to sleep with their heads elevated and apply ice packs to your eyes periodically. This will keep inflammation down. After about a week, patients can return to work. In two weeks, patients can wear contacts, apply makeup, and exercise, at which time the bruising should have completely disappeared. As swelling and bruising subside patients will start to notice results. The eyelids will continue to improve in appearance for up to a year. In addition, scars will fade and become virtually undetectable. Eyelids will continue to age, however, blepharoplasty provides long-lasting results. Sometimes, patients choose to undergo upper eyelid surgery at the same time as additional procedures to enhance the beauty of other parts of the face. For example, you may want to improve the appearance of your lower lids with a lower blepharoplasty. Additionally, patients can receive a brow lift or endoscopic brow elevation. If the drooping lid is the result of a weakened muscle in the eyelid, called Ptosis, you may need ptosis repair surgery. Is an upper blepharoplasty your ticket to looking younger? Call our office now at 314-567-3567 to find out. Ophthalmic Plastic & Cosmetic Surgery, Inc. serves St. Louis, MO and surrounding areas.